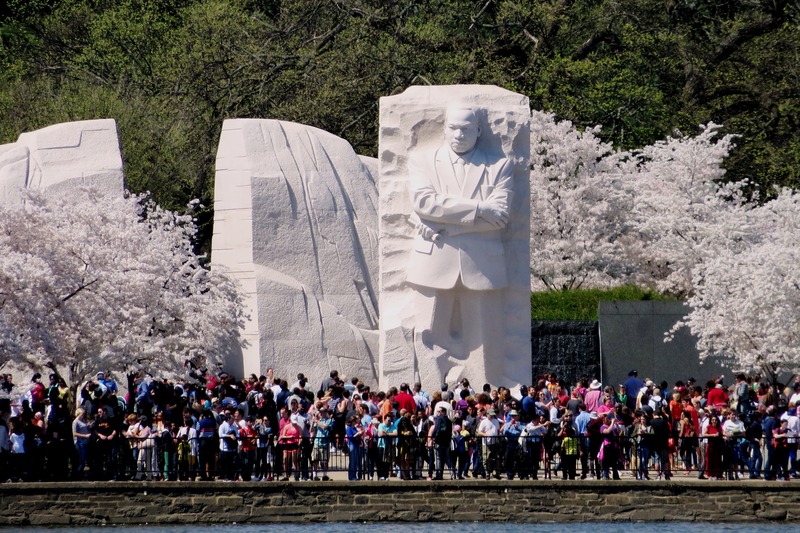 Crowds admire the King Monument during the Cherry Blossom Festival, April, 2015. Today we remember Dr. Martin Luther King, Jr., and honor the values for which he lived and died. Some will think first of his pivotal role in the American civil rights movement. Some will remember his ministry and his devotion to the Christian faith. Courage in the face of persecution, determined adherence to the principles of nonviolent resistance, and dedication to promoting worldwide brotherhood and justice are foundations of his enduring legacy. Perhaps the single aspect of his character that inspires me most is the underlying hope that sparked his tireless efforts. His life, as well as the era in which he lived, provided ample reasons for cynicism, despair and resignation, but he refused to be defeated by the darkness. I am not unmindful that some of you have come here out of great trials and tribulations…You have been the veterans of creative suffering. Continue to work with the faith that unearned suffering is redemptive. King was speaking here to those who had been jailed, persecuted and brutalized for their work in the civil rights movement, but his words reach beyond his immediate audience and touch the hearts of many “veterans of creative suffering” facing other difficulties and challenges. In reminding us that suffering brings redemption, he strengthens our spirits and renews our determination to persevere. Today, whatever problems you may be facing, I hope you will find inspiration in King’s dedication to keeping the dream alive. It was in high school (perhaps at graduation?) That I heard that it’s important to have a dream (or goal) so large that you cannot complete it in one lifetime. Maybe that’s how we keep the human race moving forward? Hi Susan, YES, we should set our sights high, and even if we never get there, we’ll still end up higher than we would have if we set the goal too low. I love Micah 6:8 – it has long been one of my favorite Bible verses. I have it on a fridge magnet at our York home. Brrr, it is cold outside. Good morning Julia hope all is well and life is good. I have been thinking about Jeff and I hope he is staying strong. He and the rest of the family is in my prayers. I went for my 6 month check up and got great news. One more year down and it is almost reunion time. I go back in 6 months. He did find a small hernia but we are just watching it. Once again thank you for doing your blog. Hugs and love to all. HOORAY for your good news! I think I’ll celebrate. It’s cold here today and I was trying to work up some incentive to walk. I decided to try a new route (with some unpaved short cuts, hee-hee) and as a reward I will treat myself to a small pizza. I’ll let you know how that goes. 😀 Seriously, I am so happy to have this news to brighten my day today. Amazing to think that NEXT YEAR we will be scheduling our 5-year survival celebration! Thanks for being here today with extra sunshine to warm things up. What a marvelous post to honor a person who inspires us to go beyond what we can see & to aspire to something greater. You, also, spread HOPE with your words & continued encouragement! Micah 6:8 is a great reminder! A favorite of mine, as well. Thank you, Mary Ann! Sometimes we tend to make things much more complicated than we need to. Micah 6:8 gives it to me in a nutshell, and that is a tremendous help. Love you! Julia, just thinking about you and Jeff and Matt. I pray the boys are doing well. I keep you all in my prayers each day. Always look forward to reading your thoughts on life. Ron is doing so much better. We went and had his last teeth pulled and new dentures last Friday. He is having trouble wearing them, but I pray he will keep trying. Love to you! Cherie, thanks so much for your prayers and good wishes. I’m glad to hear Ron is doing better. Jeff would certainly sympathize with the denture fit problems, as he’s seen it in so many people throughout his career. But as with so many other modern fixes that were once nonexistent, I suppose it’s better to have dentures than not to have any teeth. If Jeff and I have learned anything in the past 3 years, it’s been a continual lesson in adjusting to new circumstances and being thankful for what remains. Thanks for being here with us! Wonderfully written. He was a man we need more of these days. I wish there were no need for men like him willing to take a stand for those who need his strength. I’m sorry things have not completely resolved for the better. We will always have prejudice which is so sad. Have a good week, Julia. Yes, I’m thankful that we have some of his speeches recorded to hear again, so many years after his death. Jeff and I were listening to him Monday and marveling at what a beautiful, resonant voice he had. It made his words all the more powerful. We are not where we need to be in this and so many other areas, but I keep reminding myself to give thanks that we are not where we used to be, either. Hope you have a good week too! Thanks for being here. Hello hello dear friend. I guess that’s one statue we didn’t make it too, I shall put it on the list for next time though. What a grand statue to be standing there, looking out amongst the people. It amazes me that the artisan can keep everything in proportion when working with such a massive piece of stone. OH, thank you K! 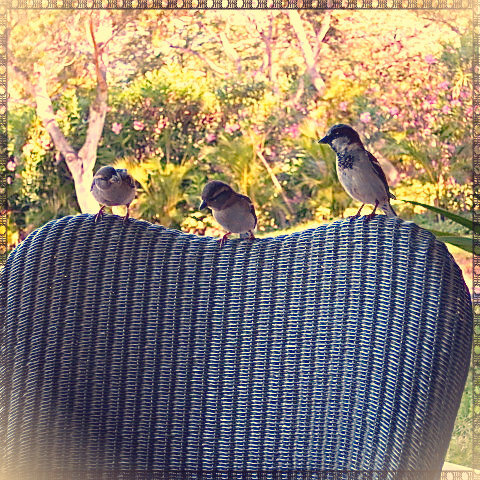 I miss those tiny adorable birds!! There used to be lots of them that would perch in the avocado tree outside our bedroom window. I never knew what kind of birds they were, but they were so tiny and lively, great fun to see. Thank you for sending me some Aloha in this photo!! Sheila, it has indeed been a DOOZY in all caps! Our virtual tea time has been almost 24/7! Details to come, as they say…but meanwhile we are surviving it and even enjoying a bit of fireside time. Did you get any crazy weather there at the beach? I’ve heard most of the eastern US mentioned in the weather news, but no word from SC…Hope you are enjoying a nice weekend, whatever the weather! A truly great man. I love the phrases “creative suffering” and that “unearned suffering is redemptive” .,, great way to look at tough times, wise man. These thoughts also came to me recently in a morning devotional. I guess I’m suppose to get a message here, hmmmm. It’s a good message to get, I think. I too need to look at troubled times this way. I loved his description of the spectrum of difficulties as “creative suffering” because it re-casts how we think about ourselves in such circumstances. I think one of the most challenging thing about being overtaken by problems is the helplessness that overwhelms us at such times. King was able to remind his audience that, while suffering is fairly universal, is also is unique, many-faceted and not wholly a negative thing, and much progress is borne of such endurance. Some would mock that as wishful thinking, but I think history vindicates his point.